This bedroom three-drawer dresser incorporates the same design as our Mate's Bed Plans (03-202, 04-208 and 07-218) and completes the matching bedroom set. The drawers are large enough to accommodate personal items. 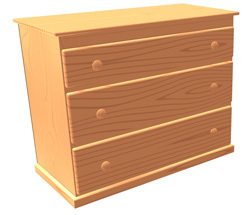 Drawers are constructed using simple dado/rabbet joinery. We recommend using ball bearing drawer slides to ensure smooth and long lasting operation. Our project incorporates simple joinery techniques and therefore, makes it relative easy to build for amateur woodworker. Overall dimensions: 20" wide by 41 1/2" long and 34 3/4" high.